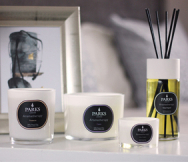 Black, the colour of strength, inspires a potent natural wax candle fragranced with oak, birch, patchouli and musk. Our Black Desire mood candle is inspired by the resilience and power of strength. A dark, smoky glass draws on colour therapy to influence the ambience and mood of your surroundings. Associated with self-confidence and self-control, use the colour black to promote inner strength and continuity. We have carefully chosen fragrance notes that complement the colour Black, promoting positivity and inner strength. Oak trees have long been a symbol of nobility, courage and power, while birch is believed to banish fear and ward off evil. We selected natural oak and birch to scent our Black candle for their positive influence and rich, woody aromas. The heady and intoxicating scent of patchouli can help to lift feelings of sadness and loss, bringing new hope and positivity. The scent stimulates the release of pleasure hormones, to rid the mind of feelings of anxiety and sadness. Musk is said to have a meditative effect, reducing negative emotions and increasing inner strength. These strong, earthy scents combine to create an enticing and potent fragrance that will uplift your mood and enhance positive energy. In our Black candle, colour and fragrance are fused to create a scented candle that encourages self-assurance and confidence. Burn your candle if you are feeling the impact of negativity, or to improve your self-esteem and inner strength.